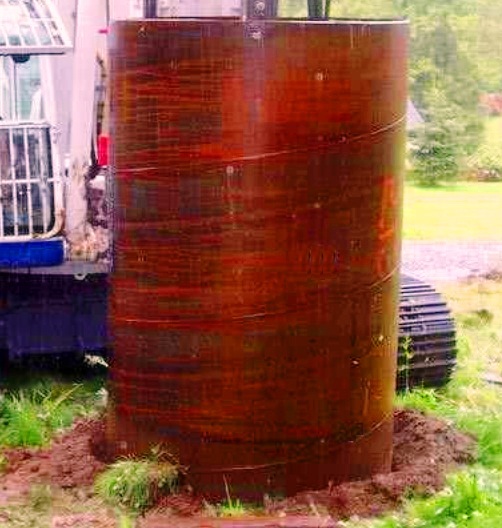 Why are Casing and Drill Mud Required to Drill Deep Foundation? The drilling is done to reach hard/stiff stratum to safely transfer loads from superstructure through deep foundation. During drilling there some problems and we have to overcome these problems. During drilling hole into soft clays, there may have probability of caving. This is due to tendency of soil to squeeze in and subsequent closing of the hole. Thus disturbing the drilling process and redrilling or removing of caved soil is required. The shape of the hole also disturbed. The main purpose of drilling is to provide concrete and steel piles or other deep supporting members, may not be possible. To avoid this situation, we use casing to support the hole in position and hold the shape and to keep the hole open. This casing has to be driven before commencing of excavation. The usual drilling mud is slurry made of bentonite and water. We have published many posts about bentonite slurry; so we are not discussing it elaborately.